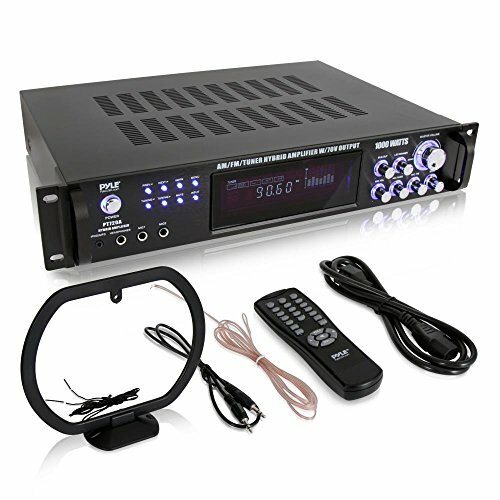 Get professional-quality sound and tons of features with this 1000-watt amplifier! The PT720A is well suited for large rooms, including stadiums, auditoriums, and for events when your sound needs to make an impact. It's got plenty of inputs, including two 1/4” mic inputs and a 3.55m jack for your iPod or MP3 player on the front, . It pushes audio over standard speaker jacks at 4, 8, and 16 ohms - or connect to your 70 V PA system. And this amp doesn't just sound great - thanks to the digital fluorescent output display meter and blue LED lighting, it looks great too. Includes a wireless remote control. Runs on 110 or 220 V.